Calvin and Hobbes, hands down. Which cooking utensil (other than the usual pots and pans) would you miss the most? My indoor grill/griddle. This has been a game changer in our house – the gas grill has always been a bit intimidating to me, so being able to toss a batch of turkey burgers on a grill in the kitchen is ah-may-zing. Would you dare to sleep in a haunted house overnight? I’m pretty sure the answer to this one is no. I’m not a fan of the dark (in a creepy way, not in a gee-look-at-all-the-stars way), suspense/thrillers, or spooky sounds in the night. What did you appreciate or what made you smile this past week? Feel free to use a quote, a photo, a story or even a combination. Watching the birds. I’ve spent the last few days not just looking at the birds but feeding them at breakfast. There are few things that make me smile like watching half a dozen tiny birds hopping around my feet. Bless. 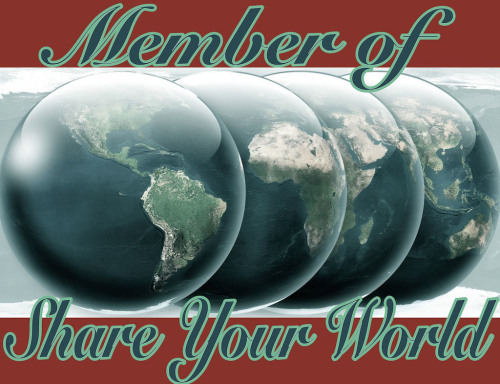 I’m dropping in late on Cee’s Share Your World this week. My birds all go up in the trees into watch mode when I go out to feed, so I get my joy when I come back in and see them through the windows. It really is something to see!